Yes, we offer only fresh premium quality products that are traditional in taste. What is the shelf life of Mithai and Namkeens? 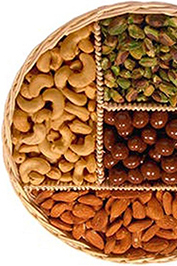 Various products have different shelf life and the same is mentioned on the package during delivery. You may also contact us to know prior to ordering if you need to know the shelf life of any product. 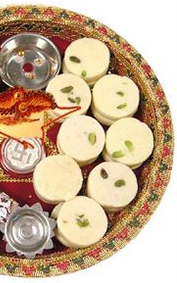 How does the 'Gift a Mithai Box' online concept work? All you need to do is log on to www.mmmithaiwala.com. Thereon you can browse our website by the different product categories given on our main page in the product section. You then click your choice of product, purchase it for your loved ones, and MM Mithaiwala will gift your surprise to your loved ones. This is the theme of 'Gift a Mithai box' online with MM MIthaiwala. What do you charge for Postage and Packing? Postage and Packing will be at actuals. Please contact us by telephone or email for a quote for overseas delivery. How soon will my order arrive? What is the Lead Time to execute deliveries? We aim to dispatch your order within stipulated time frames so that your sweets reach you as per the date of delivery, but it would also depend on the quantity ordered and the distance.. However, please check availability of the product. After receipt of payment only will we dispatch your order. Please note we normally dispatch orders from Monday to Saturday, 9 am to 7 pm, so you may also contact us for placing your order at the end of a week. Please note that orders once placed will not be cancelled, so please place your order with care. Kindly check status on our website (whether 'available' or 'on order') On the rare occasion that an item is out of stock , we will email you as soon as possible and give you the option of delivering your order without the item or holding your order until the item is back in stock. What if I am looking for a certain sweet and cannot find it on your website? Please let us know! We will do our best to find it for you and add it to our products at the shop. What if I would like the Sweets to be delivered on a specific date? Just call our Customer Service or email us and we will be happy to accommodate your requests. Yes! To the Delight of our guests. Call us to discuss on innovative ideas on what to serve at your next event. What if we have any query regarding the product or payment? Please contact us at +91 22 28899501 to 5 for information and special orders (Monday - Saturday, 9:00am - 7:00pm I.S.T), fax us at +91 22 28899506 or e-mail us at sales@mmmithaiwala.com. Is the Payment Gateway on the MM Mithaiwala Website Secure?